The Q’ero are the last of the Incas — a tribe of 600 who sought refuge at altitudes above 14,000 feet in order to escape the conquering conquistadors. For 500 years the Q’ero elders have preserved a sacred prophecy of a great change, or “Pachacuti,” in which the world would be turned right-side-up, harmony and order would be restored, and chaos and disorder ended. The Q’ero had lived in their villages high in the Andes in virtual solitude from the world until their “discovery” in 1949. In that year, Oscar Nunez del Prado, an anthropologist, was at a festival in Paucartambo, in southern Peru, when he met two Indians speaking fluent Quechua—the language of the Incas. The first Western expedition to the Q’ero villages then occurred in 1955. Recently, Q’ero elders journeyed to North America in fulfillment of their prophecies. In November 1996, a small group of Q’ero, including the tribal leader and the head shaman, visited several cities in the US, including New York, where they performed a private ceremony at the Cathedral of St. John the Divine. The shamanic ritual had not been performed for 500 years. But in the very home of those who symbolized the former conquerors of their Incan ancestors they shared their ritual and knowledge, not only with interested Westerners who were learning their ways, but also with the Dean of the great cathedral, thereby symbolically and spiritually linking the two continents of North and South America. According to ancient prophecy, this is the time of the great gathering called the “mastay” and reintegration of the peoples of the four directions. The Q’ero are releasing their teachings to the West, in preparation for the day the Eagle of the North and the Condor of the South (the Americas) fly together again. They believe that “munay” - love and compassion - will be the guiding force of this great gathering of the peoples. When the Spanish conquered the Incas 500 years ago, the last Pachacuti, or great change, occurred. The Q’ero have been waiting ever since for the next Pachacuti, when order would emerge out of chaos. For the past five centuries they preserved their sacred knowledge, and finally, in recent years, the signs were fulfilled that the great time of change was at hand: the high mountain lagoons have dried, the condor is nearly extinct and the discovery of the Golden Temple has occurred, following the earthquake in 1949 which represented the wrath of the sun. The paradigm of European civilization will continue to collapse, and the way of the Earth people will return. Even more importantly, the shamanic elders speak about a tear in the fabric of time itself. This presents an opportunity for us to describe ourselves not as who we have been in the past but as who we are becoming. 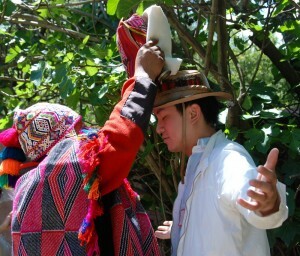 The prophecies of the Pachacuti are known throughout the Andes. There are those who believe the prophecies refer to the return of the leader Pachacuti to defeat those who took the Incas’ land. 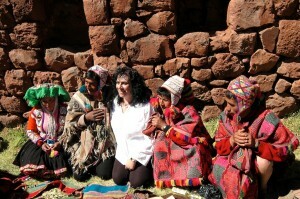 To many spiritual seekers the return of Pachacuti is taking place on the collective level. It’s not the return of a single individual who embodies what we’re becoming, but a process of emergence available to all peoples. 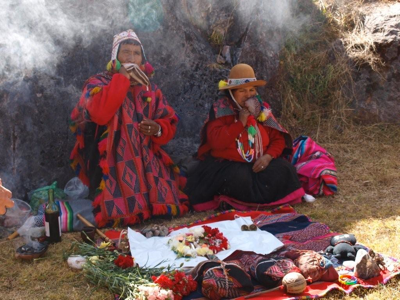 The Q’ero have served as the caretakers of the rites and prophecies of their Inca ancestors. The prophecies are of no use unless one has the keys, the rites of passage. The Star Rites, or “Mosoq Karpay” (The Rites of the Time to Come), are crucial to the practical growth described in the prophecies. Following the “despachos” (ritualistic offerings of mesa, or medicine bundles) at the ceremony in New York City, the shamans administered the Mosoq Karpay to the individuals present, transmitting the energies originating with the ancestors of their lineage. The transmission of the Mosoq Karpay is the ceremony representing the end of one’s relationship to time.